Clock has a subtly altered clock face in which 10 divisions replace the usual 12. With a hint of ironic reference to the general trend of decimalisation within Europe, the work also threatens to quite literally disrupt the system by which our lives are ordered. Clock was installed for the summer period of 2002 in The Great Eastern Hotel where it replaced the standard 3 lobby clocks. Whilst the hands of the clock will always tell the correct time, the numbers on the face no longer correspond and create a visually surreal image. 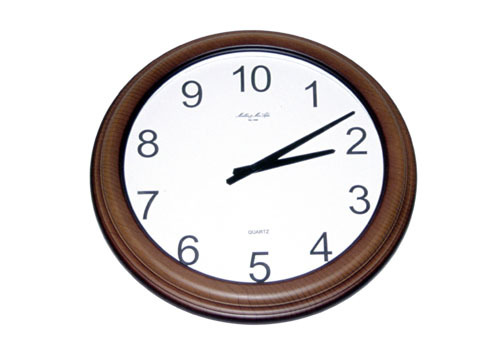 Click here to request more information or purchase clock (please specify dimensions and preferred finish).